Has your romantic partner called you clingy, insecure, desperate, or jealous? This book helps you learn how to overcome attachment anxiety using compassionate self-awareness, a technique that can help you recognize your negative thoughts or unhealthy behavior patterns and respond to them in a nurturing way - rather than beating yourself up. Start reading Insecure in Love on your Kindle in under a minute. "I've always been fascinated by attachment theory, which does a wonderful job of explaining how pivotal early events color all of life. Leslie Becker-Phelps helps us understand how 'anxious attachment' plays itself out in our current relationships--and what we do can to heal from that substantial early wound. Highly recommended!" "This is a wonderfully user-friendly handbook on healthy relating, both with others and with ourselves. Leslie Becker-Phelps mentors us in such a clear--and encouraging--way. She shows us how we can open ourselves to others while tending our own boundaries so that real love can happen." "A wonderfully readable synthesis of attachment theory, mindfulness, and cutting-edge approaches to developing self-awareness. This is illustrated throughout with practical advice and vivid stories told by a wise and caring therapist, who is a recognized expert on cultivating successful relationships." "It is rare that an author can take such a deep and meaningful subject and present it in a helpful, caring, and hopeful manner. Those who are suffering from anxiety disorders that have undermined past relationships will find her suggestions and exercises easy to understand and potentially very successful." "Insecure in Love is engaging, practical, and comprehensive all at the same time. It takes the latest theories of love and provides a useful roadmap for why couples struggle to maintain closeness. Becker-Phelps gets to the heart of the challenge and describes what individuals need to address about themselves, as well as what couples can work on together, in order to recreate a meaningful connection between two people." "Drawing on the latest scientific research but written in an entertaining and accessible manner, this book will help you understand why you're insecure in your relationships. It will also help you heal, so that you can have healthier relationships with others, and perhaps more importantly, with yourself." 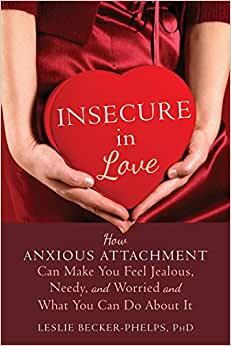 "Insecure in Love provides a step-by-step guide for overcoming the psychological hurdles that prevent so many people from finding and creating lasting and satisfying relationships. Becker-Phelps provides easy-to-use assessment tools and exercises that will help readers identify faulty ways of thinking and behaving, understand their childhood context, increase their self-compassion, and form loving and secure attachments going forward." "Leslie Becker-Phelps explains how early attachments can create obstacles to healthy and secure connections in adult romantic relationships. Insecure in Love provides the self-knowledge and the tools necessary to overcome these obstacles and get you closer to feeling secure, happy, and loved in your relationships. Highly recommended for anyone who feels anxious and insecure in a relationship." "If you're single, you'll discover how to choose a partner who is truly available for a connected, supportive, nurturing relationship--someone who accepts and loves you for you. If you're in a relationship, you will gain insight into your partner's behavior and motivation and discover how to create a loving connection in which you both feel truly valued and cared for. "Filled with relevant, real-life examples and powerful exercises, Insecure in Love will help you leave your self-criticism and sabotaging behaviors behind and develop true self-compassion. No matter how much you've struggled in the past, you will finally understand how to create happy, healthy relationships and experience true, lasting love." "Motivated by her professional interest in humans and attachment theory, Dr. Becker-Phelps has developed a solid resource for men and women to improve their lives and their relationships. Insecure in Love is a clear and comprehensive guide for self-understanding and self-compassion in which readers are encouraged to explore themselves and complete step-by-step exercises. The end result will be greater understanding of your relationships and a healthier, more secure self!" Leslie Becker-Phelps, PhD, is a psychologist who treats adults in both individual and couple therapy. She writes the blog Making Change for Psychology Today, and previously served at Somerset Medical Center in Somerville, NJ as director of women's psychological services and chief of psychology in the department of psychiatry. She lives with her husband and two sons in Basking Ridge, NJ. Find out more about her at www.drbecker-phelps.com. Although some of these concepts were familiar to me Leslie Becker-Phelps writes in a clear, concise way which helped the ideas sink deeper. If you're inclined to attach quickly and struggle with feelings of low self-worth, jealousy and insecurity this is a must read. So crap I couldn't even finish it. Regretful purchase. 5.0 out of 5 starsIF you're struggling to feel secure and comfortable in your relationships, help is here! Words can't express how grateful I am that this book was written! Learning about Attachment Theory and learning about being Anxiously Attached has been extremely liberating. "Insecure in Love" helped me to understand not just who I am, yet why I am, who I am. Something that no counseling (individual or group), no church service or bible scripture or any conversation with anyone could help me see or understand. I always knew that something was different and understood that I just don't operate in relationships like other people, yet the missing piece to the puzzle was why and where it began. Being a therapist myself, I recognize that w/out a proper diagnosis, you can't treat the real issue. "Insecure in Love" allowed me the opportunity to address the real problem from the root. I must admit that I am still very afraid of being able to make the necessary changes as I am slowly (and consciously) working through the exercises as instructed. I am courageously confident that finding peace is an option, because I at least feel understood and I have a name for what it is and a plan to fix it. This book was wonderfully written and provides examples to make it even more comprehensive. If you truly want to take a step in the right direction, this book will help you get there, not to mention, the author affords you the opportunity to contact her personally if needed (I actually spoke to her). She is a true HELPER and that speaks volumes about the impact that her work will have (and is having) on those in need. 5.0 out of 5 starsWhy didn't I know this sooner? I picked up this book after a breakup and after I took an online test that revealed me as having an insecure attachment style. I wish I knew I was this way before my breakup. I may have been able to have had a better chance of a more healthy relationship; and we may even still be together. This book breaks down the insecure attachment style more than into just three main attachment style categories. Not only did I discover I was of the insecure style but also more in the “Fearful” category! OUCH!... I say ouch, because the book describes this style as particularly difficult to deal with. And believe me, I am starting to deal with my style head on and it is very difficult so far. The book has a lot of workbook style content – like questioners, charts, and exercised that you can benefit from. I was able to screen grab the parts I wanted to use from my Kindle reader on my computer screen. If you can buy a printed copy too, then that would be helpful. Overall I feel like this material has given me a leg up on how to conquer my insecure attachment style, and I am hopeful to earn more of a secure attachment style as I work through these exercises. I am also hopeful that the next relationship I get into will go a lot better?... We’ll see. I’m not one to typically write a review, but the reviews for this book are what compelled me to purchase and I’m SO happy I did. This book offers simplistic guidelines on how to identify the root of many personal issues that plague many people in relationships AND offers a neat and easy to follow guideline of how to help curb anxious thoughts and behaviors that sabotage relationships. Consider it a type of manual to identify, address, and curb irrational behavior and thoughts in a relationship. I read it once as an overview fairly quickly on my long commute via kindle and thought it was so helpful I purchased the hard copy to make notes and refer back to with ease. If you struggle with feeling not worthy, or not good enough even though you pour your heart into relationships just to come out on the other with yet again another failure, this book is most definitely or you! AUDIOBOOK- The narration is kinda robotic, this book has exercises that need to be done, the audiobook has no attachments for the quizes or anything else which makes it really hard to apply and work on the concepts taught... The ideas are great and I really love the concepts, I suggest you buy the printed version in order to be able to take advantage of everything this book really has to offer.